Pimp Tool is an application that can allows you to automatically post RSS feeds to your status messages. It supports Yahoo! Messenger, Skype and Google Talk. You can animate your IM status with this simple tool designed to help you share the information you find interesting and you believe your friends might find it interesting as well, promote your personal or not so personal blog, or, simply share some of your thoughts. With Pimp Tool you can create a playlist with your own personal status messages, as well as with articles from RSS feeds you have previously added. 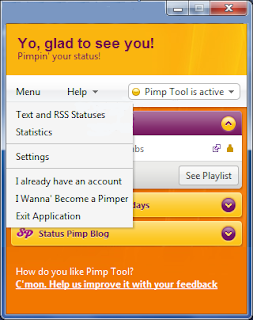 This playlist is one of Pimp Tool's main features allowing you to set and organize your status messages in the easiest way possible.